Featuring Sydney Veterinarians, Dr. Chris Brown and Dr. Lisa Chimes, observational documentary Bondi Vet is set against the breathtaking backdrop of one of Australia's most famous landmarks, Bondi Beach. 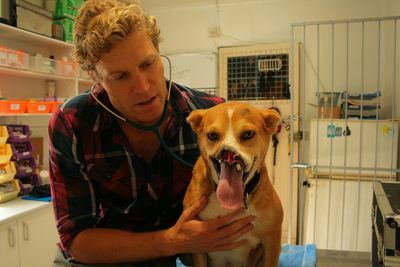 Chronicling the adventures of Dr. Chris, the series offers a unique insight into the world of one of Sydney's busiest vets and the animals he devotes his days to caring for. 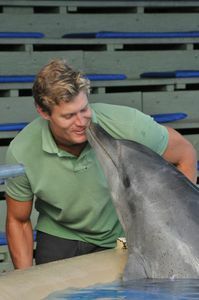 Chris will be heads to Coffs Harbor to Dolphin Marine Magic, where one of the greatest friendships between man and animal exists. Then he makes his way to South Australia to meet a three month old baby Cheetah who faces a big test, attempts to help a lady who runs a shelter for abandoned donkeys and assistant Lisa takes on a six-year-old apprentice who has arrived at SASH with her sick dog, Jelly.